An ambitious project is returning endangered black rhinos to places where they haven’t been seen in years. The black rhinoceros (Diceros bicornis) is a species of rhinoceros, native to eastern and southern Africa including Botswana, Kenya, Malawi, Mozambique, Namibia, South Africa, Swaziland, Tanzania, Zambia, and Zimbabwe. Although it’s is referred to as black, its colors actually vary from brown to grey. Once abundant in southern Chad, the black rhino was hunted for its horn, as it was everywhere it lived. In 1972 it disappeared from Zakouma National Park and by 1980 there were only about 25 left in Chad. A decade later it was considered extinct in this west African country. There are now no black rhinos left north of Kenya, and only 5055 remain in all. Now, restoration in Chad is underway. CNN’s Robyn Kriel reports in this 2-minute news video. 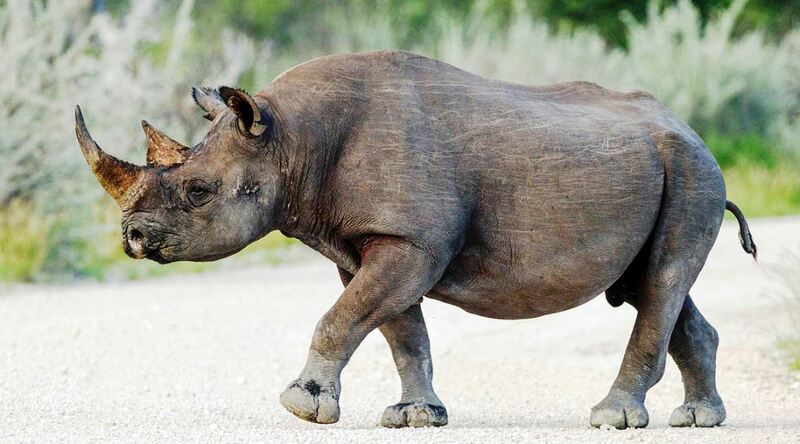 Photo of Black rhinoceros in the Etosha National Park by Yathin S. Krishnappa via Wikipedia.